All customers are welcome to pay in advance, if it suits your budget and lifestyle. When you have a credit on your account, you won’t receive another garbage bill until the credit is used up and it can save you time and postage. 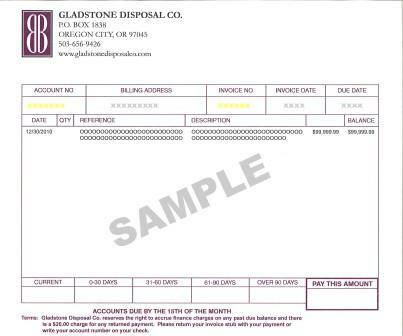 Gladstone Disposal encourages you to register on our web portal to create an online account that will allow you to view your bill, make secure payments, and perform a variety of other convenient account operations. To sign up to our new web portal you will need to "Register". You will need your account number and invoice number from the invoice you received. Your Account Number and Invoice Number are indicated on the sample below. Please click the button below to sign in or make a payment. You must click the "Register Here" link after clicking the Sign In button below and create an online account if this is your first time using our webportal! If you make an online payment, please wait up to 24 hours for a receipt to be emailed to you. If you sign up for Auto Pay with a Credit Card you are accepting the responsibility of notifying our office of when your credit card expires. We will not be sending you any notification that your card is expired or that your payment was denied because of an expired card. Your first payment will not be deducted until the 15th of the month. Each month on the 15th your payment will be automatically deducted from your bank account or credit card account. Unless requested you will automatically be placed on E-invoicing when you sign up for Auto Pay.